We all know the importance of oral hygiene. We begin and end our day with brushing and flossing our teeth. So why do so many of us find, on our visits to the dentist, that we have cavities developing, gum problems and other issues which we should not have to face? The answer is not in what we do but how we do it. Brushing and flossing is such an automatic action that we never think about what we are doing and because of this, we fall into bad habits. You may not think you need tips on how to do something you have been doing all your life. Maybe you’re right, but what’s the harm in looking at what the American Dental Associations says about the right way to clean your teeth? A few small changes in the way you brush and floss could be the difference between a cavity and a bright smile. Place your toothbrush against the gums at a 45 degree angle. Brush gently – too much pressure can wear away the enamel. Use a gentle sideways motion with small strokes.. Your front teeth have 2 surfaces (front and back) and the rear ones have a 3rd – the chewing surface. Ensure you brush all the surfaces. Clean the inner sides of your front teeth with the tip of the brush using a vertical movement. Your tongue is a breeding ground for bacteria. Brush it to remove the germs and make your breath fresher. Break off an 18 inch length of floss. Wind it around the middle fingers of each hand and use your thumbs and forefingers to hold it tight. Slide the floss between your teeth with a gentle rubbing motion. When you reach the gum line bend the floss around one tooth and slide it into the space between the tooth and gum move it back and forth. Move back to the contact area between the teeth and slide it up and down. Now curve the floss around the next tooth and repeat the action of cleaning the space between the tooth and gum. Repeat this for all your teeth. 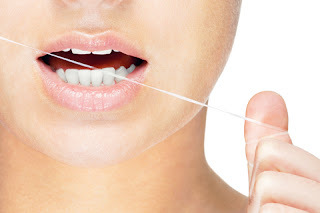 Always hold the floss firmly against your teeth and use smooth even movements. Not all tooth brushes are created equal. Unless otherwise advised by your dentist, use a soft bristled brush. The head of the brush should be of a shape and size that makes it easy to reach even the difficult areas at the back of your mouth. Antimicrobial toothpaste that contains fluoride is best for protecting your teeth from decaying. In addition to brushing and flossing, you should also use a mouth rinse. An antimicrobial rinse will help to reduce bacteria and plaque and help to prevent gum disease and gingivitis. These are only general guidelines. If your dentist has advised something different, follow that advice. And if you think this is all too much trouble, think about the last time you had a toothache and you will realize how important it really is. By the way, when did you last visit your dentist?